Pathomx aims to offer a powerful, extensible analysis and processing platform while being as simple to use as possible to the casual user. It should be possible to pick up Pathomx, use the built-in - or bioinformatician provided - tools and perform a complete analysis in a matter of minutes. Saved workflows should be simple to use, reliable and reproducible. Outputs should be beautiful. If Pathomx fails for you on any of those points, please do file a bug report and it'll be sorted out as soon as humanly possible. Before you can start you'll need to install the software. There are a few different ways to install Pathomx but they make no difference to how you'll use it. In Pathomx nomenclature toolkits provide tools with which you can construct workflows. Your currently available tools are shown in the Toolbox within the application and can be dragged into the workspace to use. Once in the workflow tools can be dragged and rearranged as you like, the position of the tool has no effect on function. Each tool has a number (0-infinity) of ports for input and output. Data is taken in via an input port, processed by the tool in some way, and passed out of the output port. 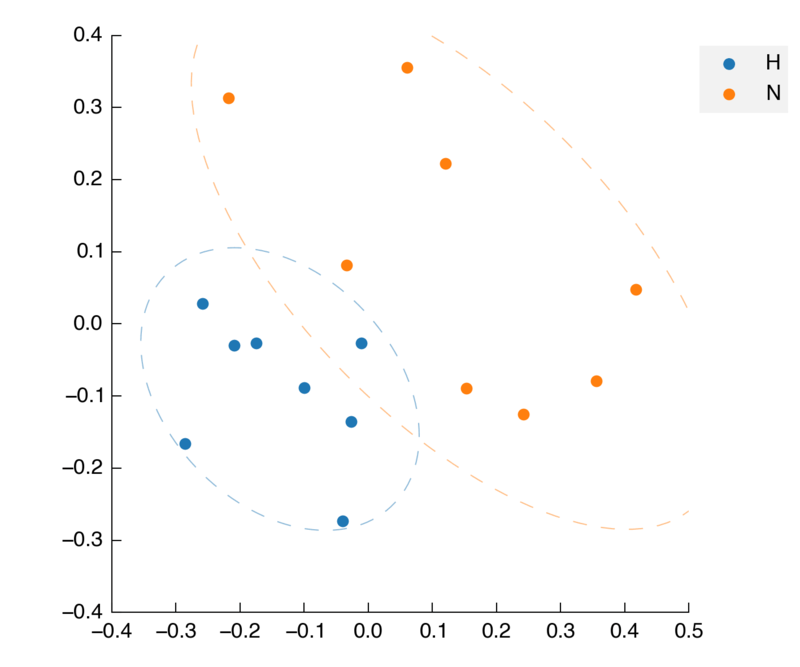 The output of one tool can be connected to the input of another by connectors which can be created by dragging from the output to the input, represented by grey circles. 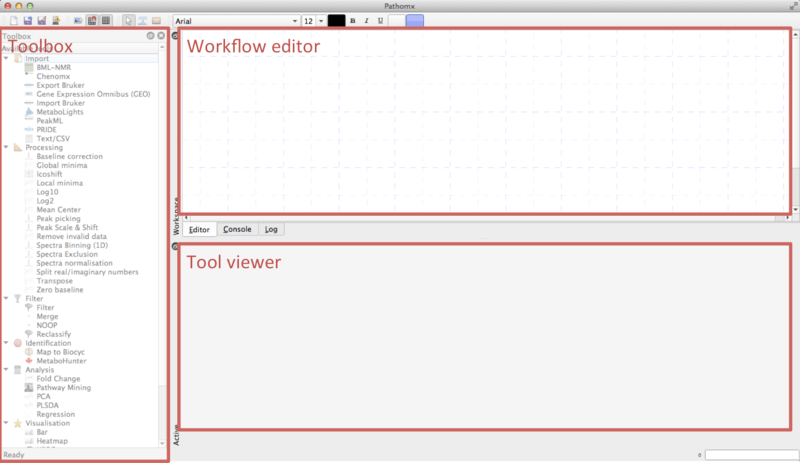 The workflow editor in the top right is where you arrange tools to construct workflows. Tools can be dragged-and-dropped from the toolbox then connected up. The are available in the workflow automatically extends to include all added tools and you can pan around the workflow as normal. If you find the workflow space too small you can un-dock it by clicking on the overlapping-window icon in the top left. The tool viewer is a multi-purpose region that shows the info, code and current outputs for each tool presented in a tabbed interface. By default the tool information is displayed, but after running the tool will automatically show the first available output. Some outputs - such as figures - can also be displayed directly in the workflow editor. When a tool is selected the toolbox will automatically change to show configuration options for that tool. In this way it is simple to rapidly reconfigure a processing workflow and see the resulting effects on the current and downstream tools. To demonstrate some key features of Pathomx we're going to perform a quick analysis using the standard toolkit and a demo data file. The downloadable file can be downloaded here. Start up Pathomx and you'll be presented with an empty workflow editor. 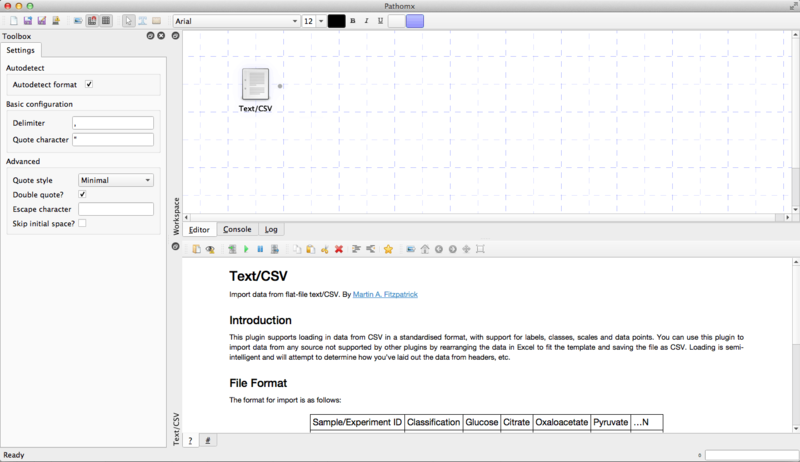 To get started we'll first add a tool that allows us to import this file: Text/CSV. Locate the tool in the toolbox and then drag and drop into the workflow (click-and-hold the tool, then move over the workflow and release). The new tool will be created in the location where you drop it. Next select the tool to activate it. Selecting the tool will activate the configuration panel on the left where you can change tool settings. Any change to a setting will trigger the automatic re-calculation of the tools output. You can control this behaviour by using the Pause button on the tool run control toolbar. The Play button manually runs the current tool. Performing further processing of the data is simply a case of adding more tools to the workflow. To return to the toolbox click any empty space in the workflow editor. Next, select the Mean Center tool and drag that into the workflow editor, somewhere to the right of the first tool. You will notice that the tools automatically connect, and the processing is automatically run (tool status bar turns blue). Any tools you add who's inputs are compatible with a previous tool's outputs will automatically connect when added. This allows rapid construction of workflows. The imported data has been mean centered. Next we'll perform a quick multivariate analysis. Multivariate analysis tools are provided in the default analysis toolbox provided with Pathomx: Principal Components Analysis (PCA) and Partial Least Squares Discriminant Analysis (PLS-DA). We'll quickly perform one of each to demonstrate how easy it is to do. Next we'll perform the PLS-DA. Find the PLS-DA tool in the Toolbox and drag and drop it into the workflow editor, preferably below the PCA tool. Again it will automatically connect, but this time incorrectly to the output of the PCA. This is because the output of the PCA is a valid input for the PLS-DA, however on this occasion this is not what we want. So, to correct the connection simply drag the output from the Mean Center tool across to the input of the newly created PLS-DA tool. Figures generated by any Pathomx tool can be easily exported to high resolution formats (TIF) for publication. Selecting outputs (tabs) that support image export will activate the Figure toolbar. Select the PLS-DA Scores figure and then click on the image export icon (small picture with an arrow) will start the image export process. The image export dialog will appear (below) that allows you change the settings for the exported image. 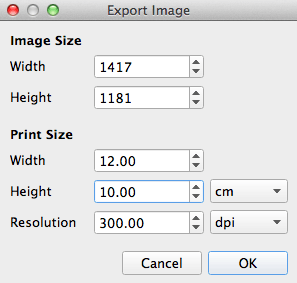 For example, you can choose a higher/lower dpi setting and the dimensions of the final image. Resulting images will be automatically scaled to fit your chosen settings. For the Scores plot the suggested size to export is 12x10cm and 300dpi for clarity. Colours and line styles can be managed for the entire workspace through the Appearance > Line & Marker Styles tool available via the main toolbar. Note that colours are applied based on experimental class groups, meaning that you can set a colour once and it will be used throughout for every output. While this has all been very nice, the real power of workflow analysis comes from the ability to re-use and re-apply the same series of steps to new data. There is a second dataset to download here that can be used to try this out. The analysis will run and the new figures will be generated. You can explore them by clicking through the tools in turn. This was a quick introduction to the use of Pathomx for analysis. To see more of what is possible have a look through some of the demos.